Having an amazing lunch box could make the entire lunch experience so much better for your kids and for you! Lunch boxes take quite a beating. They get smashed into backpacks, spilled on, and sometimes even forgotten with stinky food left in them which is very difficult to clean! If this is the case, it might be time to replace your lunch box! Isshot™ could be the perfect lunchbox for your family. Made of high-quality stainless steel interior and BPA, Phthalate and lead-free plastic, this thermal insulated lunch box keeps food hot or cold, using reliable & durable material. It comes with detachable 1/2/3 layers and you can stack or remove the layers depending upon your requirement. From soup, curry to fruits, nuts, and sandwiches, these are the best food storage containers for work, school,take-out food carrying, camping or enjoying any meal on the go. 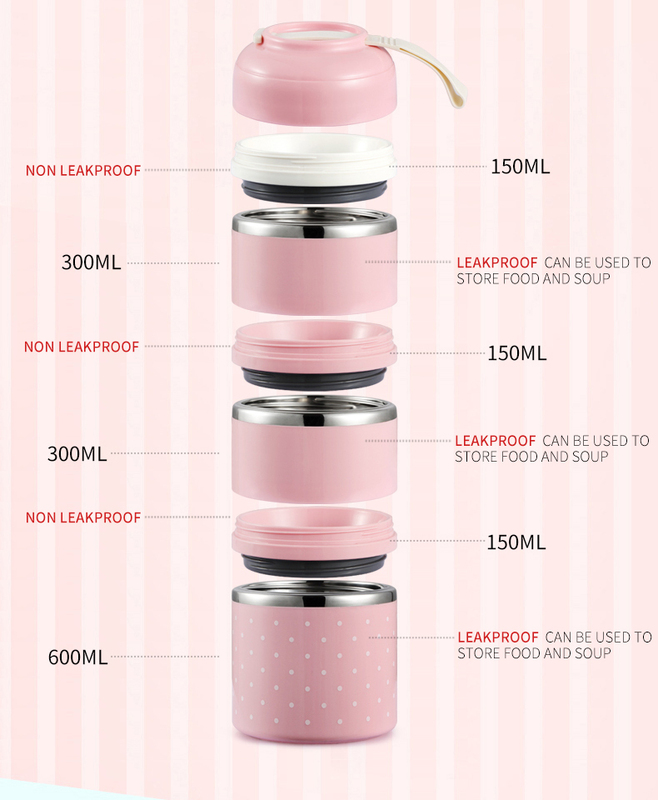 Leak and Spill Proof: Now, pack your favorite soup, curry or any food without worrying about spills and leakage during traveling. Each layer has a silicone joint and locking system that creates an airtight seal. Flexible Multi-Layer Design: Each layer can be easily removed or stacked to suit your requirements for the day. You can pack different type of food items in separate layers, keeping everything healthy and fresh. Excellent Insulation: Isshot™ is made of high-quality stainless steel and features double-walled vacuum insulated exterior which keeps your food hot for up to 2 hours and cold for up to 3 hours. 100 % Food Safe: The lunchbox is BPA free and made of high-quality stainless steel and food grade plastic. Isshot™ is odor free, easy to clean and dishwasher safe. Now, keep your food fresh and healthy for hours. Insulated Bag: If you want to save some space then the Insulated bag would make your traveling easy and convenient. Made of felt fabric and food grade aluminum foil-lined interior, it makes your food temperature last longer. The bag Includes a detachable strap, cord handle, steel zipper and handy side pockets to store stuff l - eliminating the need for an additional bag or purse. Perfect for everyone: It is perfect for work, college, school, road trips, events, picnics and so much more.